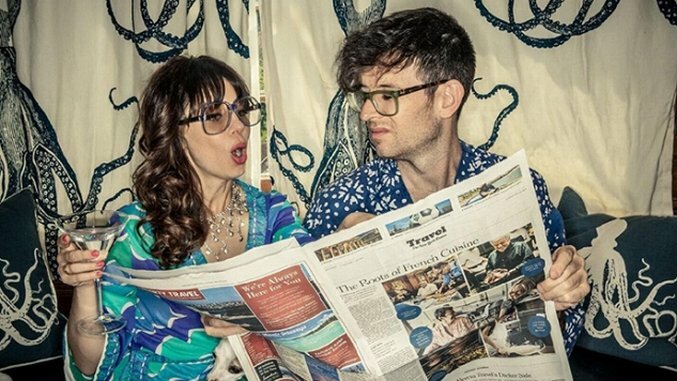 Ask comedians and newlyweds Natasha Leggero and Moshe Kasher how they met using that horrendous term (and newest Webster’s addition) “meet-cute,” and what you’ll get is an acerbically funny story that underscores how well suited they are for one another. After Kasher does a quick search for the definition (“a cute, charming, or amusing first encounter between romantic partners”) Leggero jumps right in. “Well, it’s so interesting because that’s exactly what happened,” she says. “I was in an elevator.” Directly on her heels Kasher adds, “And I was in an elevator too with my kid. My wife recently had passed away a couple of years ago, and I’d given up on love at that point.” Hearing them volley back and forth about their fictitious meeting is akin to watching a tennis match between high-level players. They know exactly where to land their shot so their partner can return it with equal force. Kasher continues, “We both pressed the thir…” trailing off so that Leggero can contribute a number they haven’t fully decided on yet—thirteenth? They both settle on the third floor. “And what are the odds, that two people would be going to the third floor?” Kasher sarcastically asks. “Or meeting this cute,” Leggero says with equal ridicule. Don’t expect many serious answers from Leggero and Kasher, who married in 2015. They have too much fun straying from the sincere path, a combination that will serve them well when they set out on a comedic Honeymoon Tour that began on May 22 in Hawaii. But it’s not a tag team experience that finds them working together onstage. This is strictly a way for them to do their own thing—but together—and do it in places they like to visit. “It’s mostly an excuse for us to be able to go on the road together to places we love, to extend our honeymoon,” Kasher explains. “I almost never envy musicians, because HPV and stuff like that, but as a comedian the only negative part about being on the road—at least musicians have their bandmates—is you’re really by yourself,” he says. “That’s why people like to bring friends to open for them. The loneliest part of existence is that you don’t have a partner, that’s why everybody starts seeking one. So when you find one that’s a comedian that then you can go on the road with, that’s a great excuse to end the crushing loneliness that is existence. I don’t think that’s why we got married, but it was a bonus.” Leggero cannot contain her giggles. Their senses of humor work equally well as individual acts, but play off each other to added effect. It’s a partnership they’ve applied to projects besides stand-up comedy tours. She is one half of the feminist brain trust behind Comedy Central’s Another Period, a show she spearheaded but which Kasher contributes to as well. In addition to writing for the show, Kasher plays the mischievous Dr. Goldberg. “This cast of characters is so fucked up and twisted, and it’s all thanks to Natasha and Riki [Lindhome],” he says appreciatively. “They came up with the characters. Some of the details in there are so weird, the plot realities of what’s happening in that house is so bizarre.” The show returns for its second season June 15.